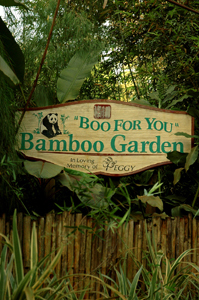 Welcome to the Boo For you Bamboo Garden online location. We have chosen to make this online location available to all of our out of town customers who wish to purchase plants and either have not yet been to the physical location or wish to purchase more without the travel involved. Our species list is now over 230 varieties and even some that do not work in our area well, just may flourish in your climate. I tell the local folks that come in, that if you are not using bamboo in your yard or garden yet you are doing your self a grave disservice. Those that have availed themselves of this unique niche plant have yet to repent and return any of it. We pride ourselves on being a "garden" rather then a nursery and that means that you the customer or the visitor will see "specimen" plants that are already huge and not have to guess about a small pots "future look" in your own yard or garden. Our goal is not to sell you bamboo but to show you what bamboo can do for you. We let the bamboo sell itself. A look at some of our specimens will make this very understandable. 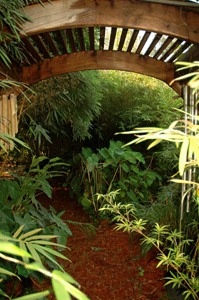 While bamboo is the main stay of what we sell, we also carry a huge assortment of unusual and hard to find tropical plants suited to our climate and perhaps yours. Bananas, gingers, ornamental grasses, ear plants of all sizes and colors, ground covers to finally whip your weeds once and for all. We even carry all sizes of dried bamboo for your home or your "honeydoo" projects. The list is long and growing (no pun intended) every sunny day here in the panhandle of Florida's gulf coast. Many of our plants have successfully been transported to all parts of the lower 48 states and we have sold in Canada and Alaska as well. If you wish for a tropical look on top of your apartment building in lower Manhattan you are in luck as we have successfully accomplished that too. We believe that our customers become our friends and we treat our friends very well and make accommodations to help them grow the plant of their choice in the area of their choosing. Your first visit to "Boo For You" will in all likely hood begin the establishing of a relationship that may last you for many years to come. WE strive to satisfy even the most discriminating customer and we pray that you will be the next one through our gate. Until we see you in the flesh may God richly bless you and yours as we live and prosper in these great United States. Give us a call or Email for more information and prices on these special items!